(Boston, MA) The end of war is something that is looked on as a celebratory event. Images of servicemen returning home, country’s flags being raised, and a collective sigh of relief from the population are the usual symbols that are associated with victory. There is however always a losing side in a war who must deal with a devastated homeland, a shamed or exterminated army, and the loss of everything their civilization was or could ever be. Taking place between the events of the Homer’s famous poems The Iliad and The Odyssey, Euripides’ Trojan Women looks at the devastated remains of Troy after its famous fall at the hands of the Greek army and at the shamed women who are to be taken by the Greeks as a prize. Trojan Women is a play mainly plotted around the Trojan Queen Hecuba (Rosalind Thomas-Clark) and a three piece chorus of women (Jen O’Connor, Adrienne Paquin, and Mara Radulovic) who watch what becomes of their land after it has been conquered by the Greeks. The conquest itself is divided into the stories of three different women. Cassandra (Aimee Rose Ranger) who has gone mad with grief over the fallen city and has a prophecy that foreshadows the events of The Odyssey, Andromache (Ranger) who is told her son Astyanax (Adam Figler) must die out of fear that he will attempt to avenge his father Hector and kick start a Trojan uprising when he grows up, and finally Helen (Ranger) who must stand trial before her husband Menelaus (Nathaniel Gundy) and Queen Hecuba for starting the war. During and between these women’s fates being determined, we find what the Greeks’ final plans are for Troy and receive the God’s perspective on the events that occurred..
Trojan Women is a play that is deeply infused with the theme of destruction. Everything from the set pieces to the audience seating is made of strewn about boxes, torn rags, and makeshift structures used to set the feeling of desolation. 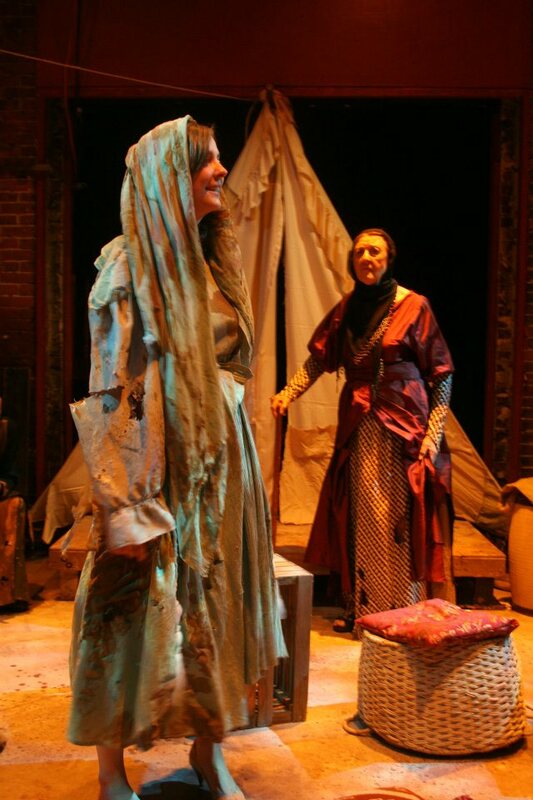 The costuming is mostly done in a haggard Gypsy style, with the woman wearing stitched together rag dresses with their living quarters depicted as a beat up tent. The three major set pieces of a destroyed Troy, the P.O.W. camp, and the Greek ships are all simply portrayed via bombed out sections of the theater and simple sound effects. The end result is a ghost town feeling well suited to both the play’s theme as well as The Factory Theatre’s motif. Besides the minimal set dressing, the cast of Trojan Women is also extremely limited. Six actors portraying the twelve characters involved, which mostly falls on Ranger and Gundy to play everyone outside of Hecuba, the chorus, and Astyanax. Both the actors show great versatility in the taking of these multiple roles and carry everyone they portray with the enthusiasm and unique personalities that each character deserves. It falls upon Clark to give the audience the dread and disheartenment that the play is based in. This she does with fantastic monologues setting her character in equal parts rage and sorrow for her fallen city, family, and life. The play’s only true weak point would be in the text itself. If someone is not familiar with the Trojan War and the following events that occur in The Odyssey, then some of the foreshadowing and characterization can be lost. Trojan Woman however, is a play that is more about atmosphere than dialogue and Whistler in The Dark’s production of the classic play is one of the more desolate and desperate portrayal of a war torn civilization that can be seen in local theater. Fans of Greek mythology or anyone looking for a different experience as an audience member would be well advised to check it out. This entry was posted in Drama and tagged 2012, Adam Figler, Adrienne Paquin, Aimee Rose Ranger, Boston, devastation, Euripides, Factory Theatre, Greek, Jen O'Connor, June, MA, Mara Radulovic, May, Nathaniel Gundy, Rosalind Thomas-Clark, The Illiad, The Odyssey, Trojan Women, Troy, war, Whistler in the Dark by anthonygeehan. Bookmark the permalink.